Its been about a month since I started using Twitter, and I have to say the thing I’m most disappointed with is the fact that its so easy to miss interesting information. Depending on how busy I am, I may have the time to spend half a day catching up to stuff on Twitter, or I may have the chance to load my Twitter client for just 5 minutes to look for new direct messages or @replies. Regardless of how much time I put into it, I always wind up missing something, I’m absolutely sure of it. This is the difference between RSS and Twitter – RSS clients tend to collect everything from a particular feed and preserve it until I either mark things read and ignore them or actually read them. This is what I want from a Twitter client, except I think there’s a way to make this sort of thing even nicer with Twitter. I want to be able to see the most relevant tweets in my Friends Timeline. For instance, for those friends that announce new blog posts, I want to be able to see those – all the time. I want to prioritize retweets and @replies lower than original posts. Moreover, I want to prioritize certain friends’ posts higher than others. Basically, once you follow a certain number of people, the signal-to-noise ratio becomes so low that the chances of you missing out something really interesting and relevant are just horrendous. I’m proposing an alternate view of your Twitter feed – a prioritized timeline. First you’ll need to priority-order and assign numerical priorities to each of the people you follow. After that tweets will be shown in this prioritized timeline ordered by a relevance value. Lets say you order @ivantumanov as 50 and @engadget as 5. Then a new post from me (posted at the same time as the post from @engadget) will show up first. After that the two posts’ position in this prioritized timeline will decay according to how old they are. However, the relevance value for my post will decay 10 times slower than the relevance value for @engadet’s post. In this way, it’ll stay closer to the top of this prioritized timeline longer and thus I’ll be more likely to read it. Because posts may move around as time goes by (@engadget’s posts will continue falling down in relevance and moving down in this list while my post will fall down 10 times slower), a “seen” flag will need to be shown. Additionally, a filing system (To Read, To Save, For Reference folders) would be nice. And finally, thumbtacks that keep a post at a particular place in the timeline – basically freezing their relevance value so it doesn’t decay with time. The source of the tweet is obviously the easiest thing to use for determining relevance. But how about the content of the tweets? Anything that starts with RT or @ can be assigned a penalty or a promotion as far as the relevance value / priority value of that post. Things with “New Blog Post” for instance, or any other specific string can be assigned a penalty or bonus value. And for those of us who use Tweetie, anything with “(via …” can be prioritized in a specific way as well. Is there something like this out there already? If not, I’m gonna have to get my hands dirty and fiddle with the Twitter API some this coming week to make this happen. Wrist Watch – why settle for only one wrist? I have to confess, I wear a wrist watch perhaps once .. (wait for it) .. every two years. At least that’s my best estimate over the last 6 years or so. I use my blackberry exclusively for my time-telling needs (and all the appliances that tell time – my computer, microwave, cable box, tv, alarm clock, etc). So you could say I’m the last person to have any sort of useful input on the subject of wrist accessories. But after seeing this image on the right, I had an idea (assuming the watch on the right doesn’t already do what I’m proposing here – I don’t know the manufacturer unfortunately, so can’t check). 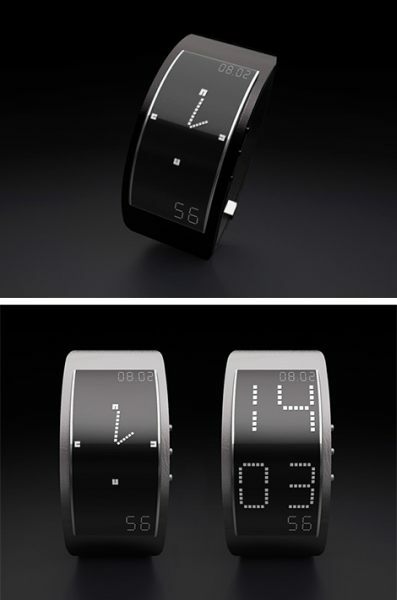 What if wrist watches came in pairs? Think about it – that way you don’t have to wear a bracelet on the hand opposite the one you wear a watch on. That way you have twice the room to accessorize and you don’t have to go through all that “my accessories have to match” hooplah. The example on the right seems to suggest keeping an analog version of time on one hand and a digital version on the other. That would indeed be interesting – if you’re righty, keep your digital time on your left hand so you can use your good hand while looking at your bad hand. If you’re being artistic with your left hand, use the analog time on the right. But here’s an even better idea – instead of trying to cram the time, the date, the year, the day of the week and all the other features onto one display – separate them onto different wrists. This also opens the wrist watch up for use as a cell phone. Set the right half to be the earpiece, and the left to be the microphone. The reason regular wrist watches can’t be used like this is because they’re just not big enough (and you don’t want them to be that big honestly) to both be the microphone and the earpiece. But this way, hold your right wrist up to your ear – you’re doing that in any case with your cellphone. Whenever you want to say something, hold your left wrist to your mouth and say what you need to say. Have the two halves connect via bluetooth. Add accelerometers or something else that’ll let the phones know which one is where, and if your right arm gets tired, switch and hold up the left wrist to your left ear, and that half becomes the earpiece (and vice versa). Of course, as an engineer, I also can’t help but think of the value of redundancy. You lose one half of your two-part wrist watch – have a button that switches function on the other side so you can always see your digits. The optimist can also say “wow, there’s less of a chance I’ll forget to put on at least one of the watches”. The pessimist of course will say “its just as likely for me to forget to put on both halves of this watch”. So who’s gonna work with me to develop this idea? While I’d love to see this in a Rolex or a Breitling, Omega, TAG Heuer or whatever your favorite luxury watch brand is – I think its way more likely that a more technology-oriented brand like Seiko or Casio would probably be more up to this sort of exercise. Actually, I wouldn’t mind an Ed Hardy branded two-part watch, I might actually wear something like that. Or perhaps a nice Nokia watch that doubles as a phone, I’ve already seen some idea sketches for a watch-phone with a separate earpiece. Am I totally off base here? Anybody else think this might be a good idea? Martin Zwilling (@startuppro) wrote about opportunities to tackle Internet privacy and I posed a question to him – “how do you authenticate an online something with an offline entity?” The reason being that I’ve been thinking about privacy on the Internet as well, but from a slightly different perspective. I’m not so concerned with things like the seemingly infinite lifetime of something said/posted to websites, or identity theft, or the resale of customer information that lots of shady companies and websites are engaged with. Well, I am personally concerned about my own information of course, but not in the sense of the business problem. I’m more interested in authenticating actions, statements, uploads and everything else an “offline entity” could do online. By “offline entity” of course I mean everything from a teenager who’s friends post as him or her when they forget to lock their computer and ruin their reputation – to a public figure or celebrity being impersonated – to a corporate entity like CNN purchasing @CNNbrk (which some people thought was run by CNN in the first place). Several things have prompted this line of thought for me. First, a friend of mine asked me how to mitigate negative press about a design brand he runs. He was asking if it was possible to get things off the first page of a google search about this brand. Of course, thats not something that can be solved, but an authenticated coherent statement from this brand regarding bad publicity might actually help mitigate the situation. There’s been several incidents of this type, for instance the Domino’s video prank incident and its effect on the value of the brand for instance. Second, for a recent project I’ve been thinking about how to authenticate somebody that comes to complete and manage an online listing for an offline company. In this scenario, listings are created for companies, the initial information is populated from an existing public records database. These companies have a vested interest in expanding their listing and participating on the website. However, how do you invite them to participate – who do you email or send a postcard to, and once they come to the site, how can you be sure that somebody appropriate at the company got that postcard and that its not a mail clerk from their building that’s signing up to destroy their reputation on this listing site? I guess what I’m getting at is this – how do you know that something done by me online is really done by me? Do we take PGP signing to the next level and set up a company that can authenticate a signed post online based on the assumption that only the real me has my private PGP key? Do we set up a company that allows mailing of secret information to physical addresses that then authenticate an invitation to a website via this shared secret “token”? I’m sure there’s opportunities to start a company that would do something interesting in this space. Perhaps even tackling the problem Martin is talking about in the process – what if we could submit our private data to websites in an encrypted packet that can only be decrypted by entities that we give permission to? Something that tracks how many times something’s been decrypted and used for instance, perhaps an intermediary or an escrow sort of service for information? Any ideas? Its hard to resist signing this blog post with my PGP key, but perhaps a Wordpress plugin to authenticate posts that way isn’t that hard to make and maybe that’s a small step I’ll take in this direction sometime soon.